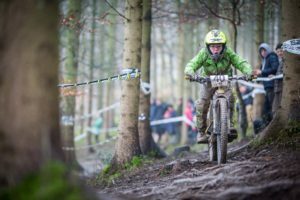 Sunday’s Downhill Race on Aston Hill’s Ricochet will go down as one of the muddiest but most enjoyable Downhill Races on Aston Hill in years. 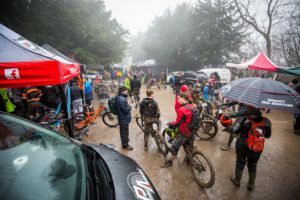 Despite the rain doing it’s best to dampen spirits it was an enjoyable days downhill racing and one that I’m sure will be remembered for years to come. As the cliche goes the track conditions were the same for everyone and Ricochet is a tough old track that can stand up to even the worst the weather can throw at it. With three dry days into the weekend it looked like it was going to be a dry race and those practicing on Saturday were experiencing Ricochet at it’s best. With rain forecast everyone was thinking positively but what would the weather bring for those racing on Sunday? Ricochet is a fast and flowing roller coaster ride from top to bottom. Out of the start gate it’s hard on the pedals for the first section of track. The new surface held up well and enabled riders to launch off the line and fly through the remodelled table tops to carry as much speed as they could into the next section of the track. Diving down over the forest road it’s hard on the brakes as the track swings left and then right again across the second forest road. Diving down into another fast left hander, riders then have a choice of lines before heading into the contoured section. Hugging the edge of the steep Chilterns escarpment riders are doing their best to hold their nerve and speed through this section. Sweeping left it’s into the section known a ‘Roof Roots’ where there are a number of lines to choose from with only the bravest going for the high line in the wet conditions. From here riders are shot out into another fast section before hitting the longest cambered, rooty section on Aston Hill. Commitment is key through this section and speed is your friend as it carries you across the roots and into the newest section of the track. Switching between the trees before diving into a combination of left and right turns that got tougher to ride as the day went on and the riders dragged the mud down the track. Those that carried their speed then hit the drop or took the inside line before sweeping through a left hander into two more drops and then carry the speed down into the finish. 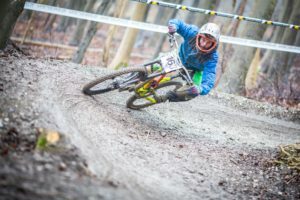 The fun hadn’t stopped though as the finish shoot was one of the toughest sections and riders reached the bottom relived to have put in a clean run or rueing the mistakes they had made up on track. The Ripper Boys weren’t hanging around on track. William Tyrrell (Pedal and Spoke/Surrey Hills Suspension) put his winter training on the Firecrest MTB DeVo Programme to good use to stop the clock on 1:52:058. Nearly 4 seconds clear of Domonic Platt in second on 1:56:035 and Achill Sweeney (Firecrest MTB DeVo) in 3rd with a time of 2:02:818. Tom Shakespeare (Firecrest MTB DeVo) came into this race determined to lay down a great time. Having been sidelined with injury at last years Black Run Race he wasn’t in the mood to make any mistakes this time. Stopping the clock on 1:42:530 on his first run he went on to shave of a few hundredths of a second on his second run to record a time of 1:41:327 and take the win. Travis Diwell-Wilson took nearly 5 seconds off his first run time second time down to record a 1:45:434 and place second. Rich Porter went nearly 12 seconds quicker on his second run to finish in 3rd place with a time of 1:51:668. 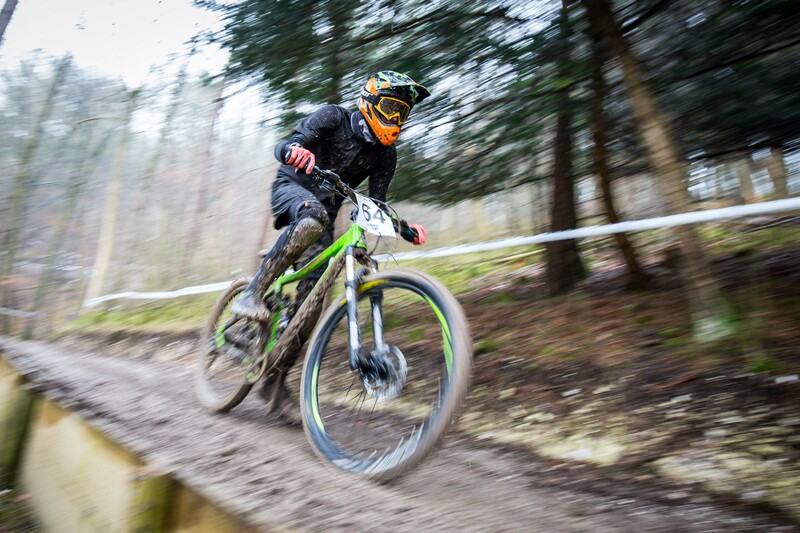 After the first runs it was Firecrest MTB – DeVo rider James Perry sitting in first with a time of 1:38:801 ahead of Sion Margrave (Moore Large/O’Neal Race Team), with all to play for going into the second runs. Sion put together a near perfect run to stop the clock on 1:37:122 and take the win from James by just 1.679s. 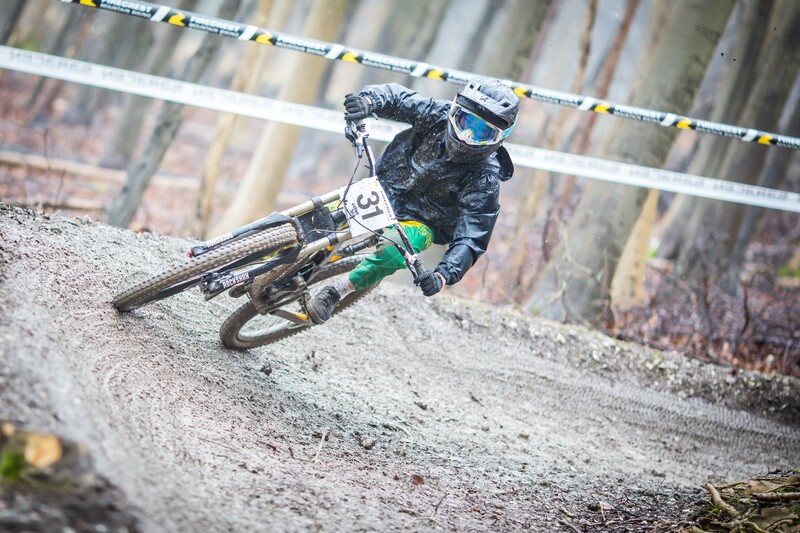 Jeremy Coe (Bikesdirect UK / SDR / Southcoast Suspension) rounded out the top 3 with a time of 1:40:326 on his first run. The first race of the season for the Junior Men is always interesting. It’s a chance to see who’s moved up to the category and picked up the pace and if the second year Junior’s have what it takes to stay on top of the time sheets. Jordan Beighton (Kreek Racing Team) was certainly consistent with his runs, with a first run time of 1:32:442 setting the pace for the other’s to match. 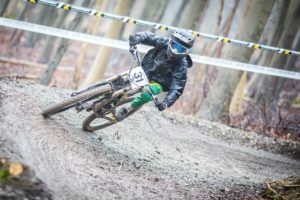 Owen Martin (Grips DH Race Team) was the closest after the first runs with a time of 1:34:416 with Team Aston Hill’s Josh Mead in 3rd after the first runs with a time of 1:35:416. Josh went on to set a faster time of 1:33:833 on his second run and sneak ahead of Owen to steel second place with less than a second between them and less that 2 seconds covering the top three underlining just how close the competition was at the top of the time sheets in the Junior Category. Watch out for these guys at the races this season. It was great to see so many Women lining up to race on Ricochet with many racing for the first time. In the Under 18 Women’s category it was no surprise to see the Team Aston Hill paring of Meghan Harris and Ellen Flewitt leading the way. Meg’s consistency saw her set her fastest time and the fastest Women’s Categories time of the day on her second run stopping the clock on 1:52:959. Ellen went 2 seconds faster on her second run with a 1:54:758 keeping Meg on her toes and just 1:799s behind. Tayla Nevard (Firecrest MTB/Nevard Racing) came home in 3rd place with a time of 2:22:103 and Paige Laurie (Summit MTB) finished her first race with a time of 2:35:456 which would have been fast enough for 6th place in the over 18 Women category. Marcia Ellis set the pace in the Over 18 Women category on her second run, stopping the clock on 2:07:357 to go nearly 5 seconds clear of Renèe Diwell in second on a 2:12:156 and Emma Bamfield in third with a time of 2:16:896. 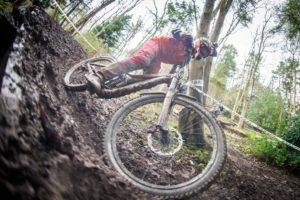 The pressure was on the Firecrest MTB Team pairing of Chris Cockrill and Pete Robinson as the first race for the FMTB Team of the season was on home turf. Both Chris and Pete have been putting in the hours in the off season to come into the 2017 race season on form with the target of winning their home race. Times couldn’t have been closer with Chris just edging Pete out by 0.656 of a second to take the win. Chris stopped the clock on 1:33:824 on his first run with Pete on a 1:34:460 and the 1-2 dream start to the season for the Team was in the bag, along with Chris’s first trip to the top step of the podium! Ben Taylor just piped Ben Joyce to 3rd place on the day with less than 5 seconds covering the top 5 riders underlining how close the competition was. 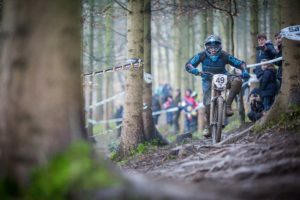 The Master’s Category always gets a shuffle at the start of a new season with riders reaching 30 and moving up from the Senior Ranks to Masters looking to make their mark at the top of the time sheets in their new category. Which of course means great racing as the old guard are looking to do their best to maintain their dominance. Andy and James Weames (Mountain Mania) set the pace with Andy Clocking a time of 1:27:920 on his first run to set the fastest time of the day. James was 2 seconds back with a time of 1:29:996 and Ross Searle (RS Security) slotted into third with a a time of 1:31:526. A stacked Veteran’s category meant that the stage was set for a great race. Guy Theron (Edd’s Bikes) set the pace on his first run clocking a 1:36:596 2 seconds clear of Lee Handley on a 1:38:863. With Lee Nevard (Firecrest MTB/Nevard Racing) going 2 seconds quicker on his second run to lock down third place with a run time of 1:40:957. The Expert/Elite Men’s field was compact but packed to the brim with talent. 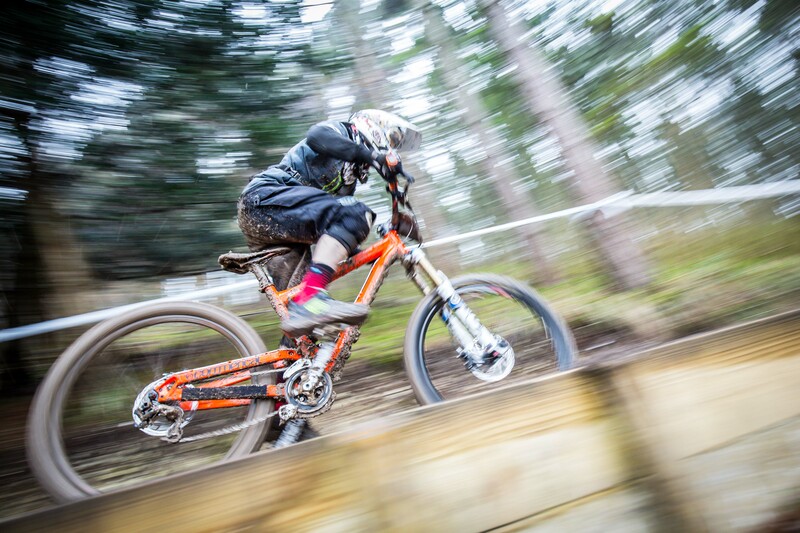 Four World Cup Racers and the fastest Hardtail Rider in the UK all looking to set the pace and take the win. It was Saracen Bikes Jack Geoghegan who set the pace on the first run with a time of 1:29:140 which he bettered by a few fractions of a second to record a time of 1:28:426 on his second run to take the win from Glenroy Martin (Grips DH Race Team). Glenroy was another rider on a flying second run clocking a 1:30:133, to just edge out first year Expert Thomas Davies (The Riders Guild) on a 1:30:487. Thomas’s time was just quick enough to edge ‘Die Hard’ Darren Evans on his Stanton Bikes Hardtail into 4th on a 1:30:487 putting the top four riders all within 2 and a half seconds of the win and underlining just how important getting things right on the race run is in these conditions. Of course the racing on Aston Hill wouldn’t be possible without the help of all the people that come together to make it happen. It’s a cliche but there are so many people to thank that I just want to say a big thank you to everyone that helped make this event one to remember. Thanks to all of our Sponsors and Partners for supplying some great prizes and to those supporting the Event. 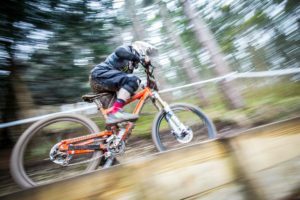 Saracen Bikes for the track tape, Blockhead Energy for the Category Prizes and Sportitrait the new rider illustraion service for the spot prizes. Mudhugger were great providing spot prizes in each of the categories. It’s great to have so much support for grass roots racing in the South of England and these companies have really shown their support so check them out next time you go online. Thanks to Will and Alex Norgan who stepped in at the 11th hour to provide the timing for me after Mike from Mikrotime was taken into hospital with heart problems. Will and Alex did a fantastic job with so little notice. Don’t forget to check out their events down at Oakford Hill Mountain Bike Park in Dorset. All the best to Mike Gettleson for a speedy recovery. He assures me he’ll be back in September to time the Black Run Race! My thanks go to the following:- John Holbrook and my dig team for their help in preparing the track and enabling it to stand up to the hammering it took from the riders and weather on the day. John and the crew that helped me tape out the track on Friday no easy task hanging off the side of Aston Hill taping the track for Ricochet. The Marshals that had to put up with the weather. I always say that we can’t go racing without them and it’s true. Thanks to them we had a safe and enjoyable day of racing. The Medical Team from FirstAid Cover Ltd. Tthankfully they weren’t too busy but they did a great job patching up the walking wounded that did go to see them. 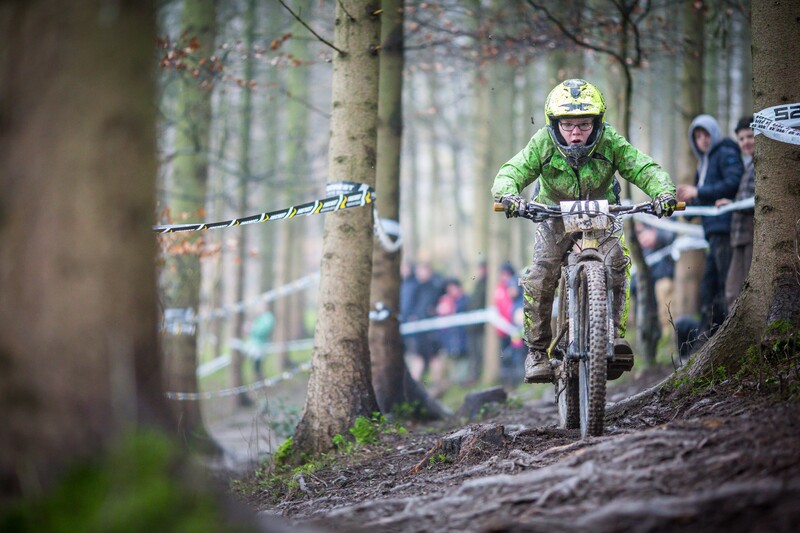 Gary and the Aston Hill Bikepark Committee for their support throughout. Jade and Tim from the Forestry Commission for all their help over the weekend. Sophy and Sam in Registration for their help making sure everyone got the right number and dealing with enquiries throughout the day. Mike, Dean, Paul and Dave on Car Park duties. A tough day getting everyone into the field and back out again. Thanks to those that helped push and to everyone for their patience. Paul Hunt from Pedalhounds we will be working together again on the Pedalhounds Enduro on Sunday 25th June on Aston Hill www.pedalhounds.co.uk for more information. The Racers without you showing up we would not have an Race. This is Mountain Biking by Mountain Bikers for Mountain Bikers and we really appreciate your support for our Events. Thank You so much.